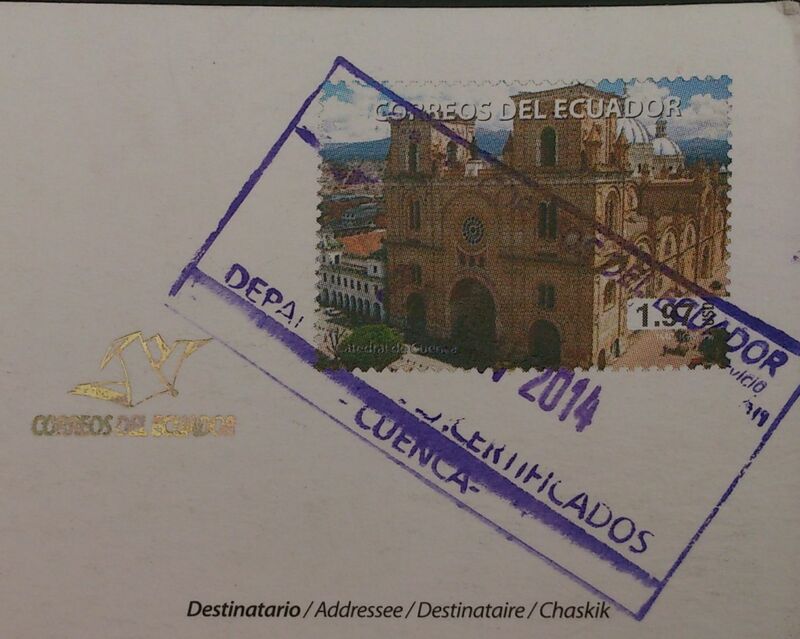 This beautiful card comes from Glauco. 🙂 However, it was sent from Brazil. The Galápagos Islands (official name: Archipiélago de Colón, other Spanish names: Islas Galápagos) are an archipelago of volcanic islands distributed on either side of the Equator in the Pacific Ocean, 926 km west of continental Ecuador, of which they are a part. The Galápagos Islands and their surrounding waters form an Ecuadorian province, a national park, and a biological marine reserve. The principal language on the islands is Spanish. The islands have a population of slightly over 25,000. The islands are famed for their vast number of endemic species and were studied by Charles Darwin during the voyage of the Beagle. His observations and collections contributed to the inception of Darwin’s theory of evolution by natural selection. 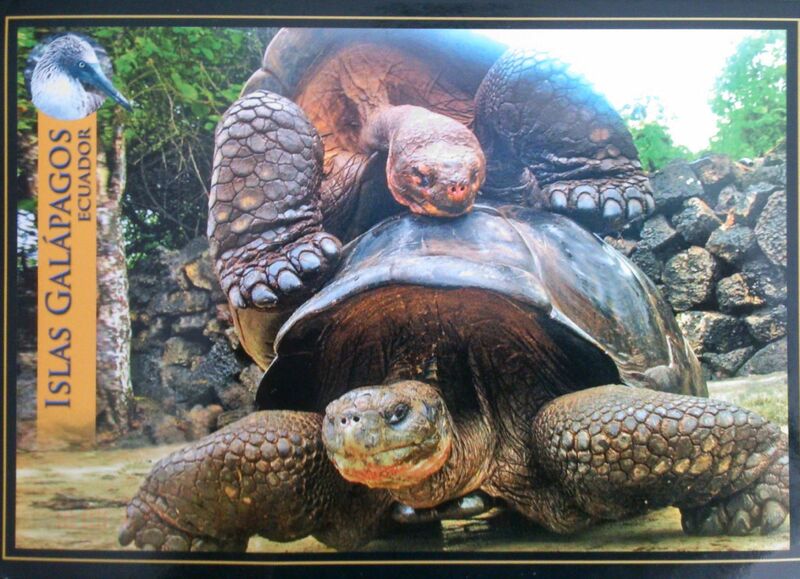 The Galápagos tortoise or Galápagos giant tortoise (pictured on the postcard) is the largest living species of tortoise. The Cathedral of the Immaculate Conception (Spanish: Catedral de la Inmaculada Concepción), commonly referred to the as the New Cathedral of Cuenca (Spanish: Nueva Catedral de Cuenca), is the cathedral church in Cuenca, Ecuador. It is situated in front of Parque Calderon. The plan of the Cathedral was drawn up by Juan Bautista Stiehle (1829-1899) — a German-born friar who arrived in Cuenca from Alsace in 1873 — on suggestions made by Bishop León Garrido. The Cathedral took over the function of the nearby Old Cathedral that had become too small. Construction works started in 1885 and lasted for almost a century. This building combines many architecture styles, but Romanesque Revival is predominant. The cathedral is surmounted by three giant domes covered by striking blue and white glazed tile from Czechoslovakia. Its stained glass windows were created by Spanish artist Guillermo Larrazábal. Its towers are truncated due to a calculation error of the architect. If they had been raised to their planned height, the foundation of this Church to the Immaculate Conception, would not have been able to bear the weight. In spite of the architect’s immense mistake, the skyline of its domes has become a symbol for the city. Its facade is made of alabaster and local marble, while the floor is covered with pink marble, brought from Carrara (Italy). 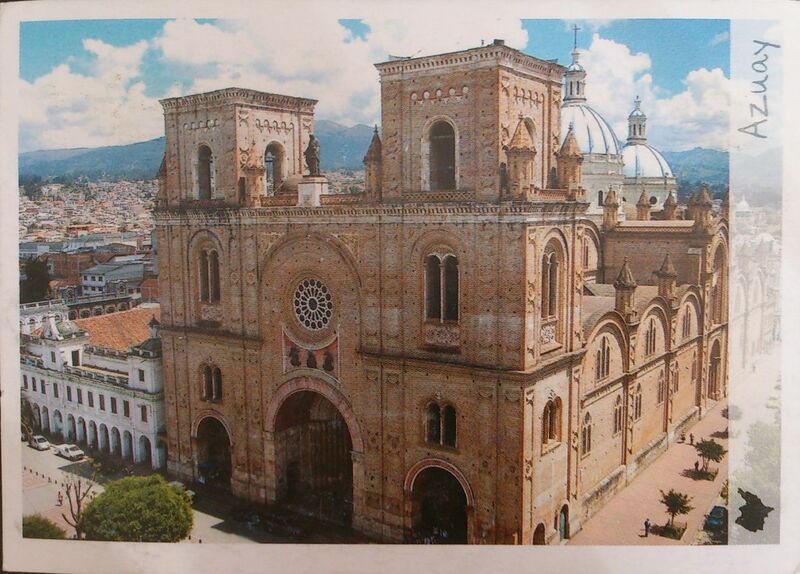 When the Cathedral was first constructed 9,000 out of Cuenca’s 10,000 inhabitants could fit in the building.